The 2017 Puebla earthquake struck at 13:14 CDT (18:14 UTC) on 19 September 2017 with a magnitude estimated to be 7.1 on the Seismic scale approximately 55 km (34 mi) south of Puebla. It has caused damage in the Mexican state of Puebla and the Greater Mexico City area, including the collapse of over twenty buildings. 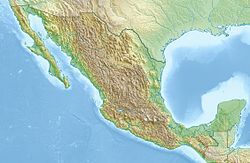 The quake occurred on the 32nd anniversary of the 1985 Mexico City earthquake, which killed about 10,000 people. The 1985 quake was commemorated on its anniversary with a national earthquake drill at 11 a.m. local time, two hours before the earthquake struck. ↑ Sismologico Nacional [SismologicoMX] (23 September 2017). "Réplicas hasta las 12:30 hrs del 23/09/2017" (Tweet) (in Spanish). ↑ "M 7.1 - 5km ENE of Raboso, Mexico". United States Geological Survey. 19 September 2017. Retrieved 19 September 2017. ↑ CNN, Nicole Chavez, Steve Almasy, Ray Sanchez and Darran Simon. "Central Mexico earthquake kills scores, topples buildings". CNN. ↑ "Van 117 muertos por sismo en CDMX". www.reforma.com. ↑ "Powerful Earthquake Shakes Mexico On 32nd Anniversary Of Deadly Temblor". NPR. 19 September 2017. Retrieved 19 September 2017. ↑ "Starkes Erdbeben erschüttert Mexiko" (in German). Tagesschau. 19 September 2017. Retrieved 19 September 2017. This page was last changed on 18 April 2019, at 14:18.